Toronto, 20 May 2016 — At a special ceremony held this evening, the Pontifical Institute for Mediaeval Studies awarded Mawlana Hazar Imam an honorary degree for his service to humanity. A Doctor of Letters in Mediaeval Studies honoris causa was conferred upon Mawlana Hazar Imam at St Basil’s Collegiate Church by the Chancellor of the Institute, His Eminence Thomas Cardinal Collins, the Archbishop of Toronto. David Mulroney, President of the University of St Michael’s College and a former Canadian Ambassador to China, delivered the citation. “Let us celebrate today our own connection to His Highness, a champion of pluralism, a transcender of borders and barriers, and a great, wise and benevolent connector,” said President Mulroney. Founded in 1929, the Pontifical Institute for Mediaeval Studies is the oldest humanities research institute in Canada. It is dedicated to advancing studies in the intellectual and material cultures of the Middle Ages, and to deepening the understanding of how this period has shaped life and ideals in Western culture. It received a papal charter in 1939. “Canadians take special pride in the links that connect us to the Aga Khan, to the Ismaili community and to the important values that they so effectively champion,” said President Mulroney. The citation also recognised the extensive work of the Aga Khan Development Network in Afghanistan. By strengthening its economy, revitalising its cultural assets and upholding its rich historical diversity, AKDN has helped to rebuild a shattered society and restore its humanity. Mawlana Hazar Imam was accompanied by Prince Aly Muhammad. The ceremony took place before a distinguished gathering that included former Governor General of Canada Adrienne Clarkson, Senators Nicole Eaton and Vivienne Poy, and Calgary Mayor Naheed Nenshi. Senior Jamati and institutional leaders were also present. President Mulroney concluded his remarks by recounting an experience from his time as Ambassador to China between 2009–12. Having learnt of the existence of an Ismaili community established the west of the country, he decided to travel to the Chinese city of Tashkurgan to meet them. The convocation of the Pontifical Institute of Mediaeval Studies took place at St Basil’s Collegiate Church in Toronto. Mr. David Mulroney, President of the University of St. Michael's College and former Ambassador to the Republic of China delivered the citation. Given the energy and vigour with which his Highness pursues his calling, and the extent to which he has used it to benefit not only Ismaili Muslims but a broad range of communities around the world--with a particular attention to the most vulnerable--it is all the more impressive to recall that His Highness has been serving in this remarkable capacity since 1957. The Aga Khan Development Network partners with public and private institutions around the world to build (often, actually to re-build) the institutions necessary to sustain and nurture communities. This mirrors the activism of the Ismaili community, whose members are among the agents of change, the difference makers, in so many parts of the globe, Canada included. Canadians take special pride in the links that connect us to the Aga Khan, to the Ismaili community and to the important values that they so effectively champion. It is a bond that stretches back to 1972, to an earlier Trudeau era, when Canada provided a home to thousands of Ismailis who had been expelled from the Uganda they had helped to build. Many have been the rewards that have flowed back to us, most notably the remarkable and continuing contribution of the Ismaili community to our national life. His Highness has himself been most generous, as visitors to the Aga Khan museum here in Toronto can attest. He has also paid us the compliment of associating us with a powerfully important word: pluralism. As he has written, pluralism is “one of our fundamental values and an inescapable condition for world peace and further human development.” He generously reinforced the connection between Canada and respect for this value by making our national capital home to a Global Centre for Pluralism. This is a gift that keeps on giving, because the Centre also serves as a perpetual reminder to Canadians of what we can offer the world when we are truly at our best. His Highness, through the work of the Centre, reminds us of our duty, and inspires us to do even more. Pluralism inevitably involves that most Catholic of words, connectedness. And His Highness is a great connector, a builder of bridges metaphorically and actually. He has, for example, reconnected Afghanistan with its traditional role as a cross roads of trade and people, art and ideas. This has been evidenced by the construction, thanks to His Highness, of multiple bridges linking Afghans with their northern neighbours. But it has also been achieved through numerous projects designed to re-connect Afghans with their history and rich array of cultures. His Highness is a great proponent of something that the friends of this Institute also know so well: that openness to learning and culture inevitably restore a sense of common humanity, and with it, an awakened appreciation of the many signs that do indeed point to our Creator. These natural impulses to learn, communicate and connect were anathema to the extremists who for too long held sway in Afghanistan. Such implacable enemies of progress, tolerance and pluralism sought to disconnect Afghanistan from its neighbours, to uncouple it from its history, and to deflect it from its future. They did great damage, but His Highness has helped to rebuild and reanimate a broken society. Thanks to the efforts of the Aga Khan Development Network, life is returning to the Bamyan valley, where the tolerant Hazara people, primarily Shia Muslims themselves, embrace a history that includes the golden age of central Asian Buddhism. And in Kabul, a city shattered by 30 years of war, hope and pride have taken root in the restoration, again thanks to His Highness, of the mausoleum of the emperor Babur, and of the great gardens that surround it. Babur was the founder of the Mughal Empire, and a contemporary to those similarly ambitious and larger-than-life princes Henry VIII and Francis I. He laid siege to Kandahar in the same year in which Henry and Francis laid siege to one another at the Field of the Cloth of Gold. Allow me a personal observation on His Highness as a builder of bridges and a connector of people. While serving in Beijing, I was interested to read one of His Highness’s speeches in which he remarked on the size and vitality of the Ismaili community in the far west of China. So, I travelled to the city of Tashkurgan to meet them for myself. It was a deeply moving experience, and one that resonated with me as a Catholic. I met people of faith and hope and tremendous goodwill. They readily acknowledged the sorrow of being physically separated from their Ismaili brothers and sisters and from His Highness. But they displayed a profound and confident spiritual connection to their global community. They possess a faith that refuses to be hemmed in or isolated by man-made barriers, a conviction that owes much to their very real and justified sense of being in communion with their spiritual leader. Let us celebrate today our own connection to His Highness, a champion of pluralism, a transcender of borders and barriers, and a great, wise and benevolent connector. 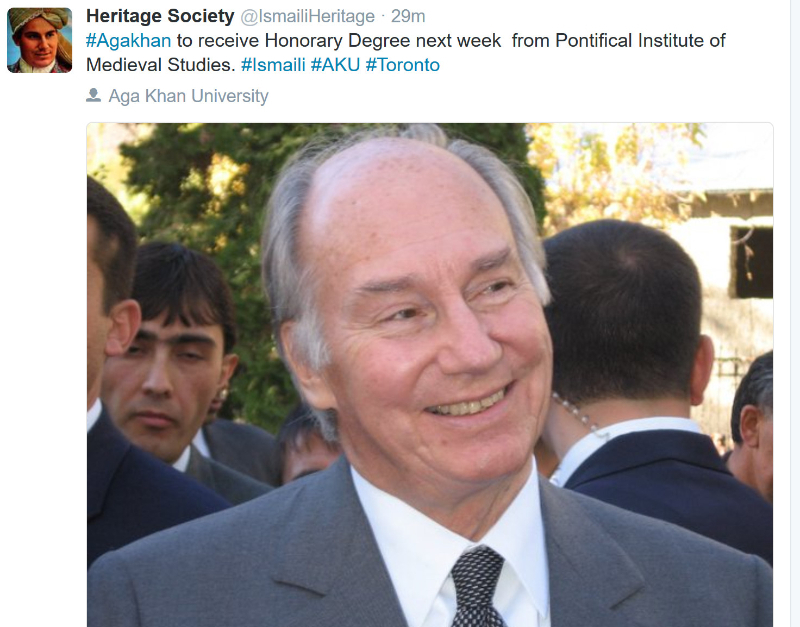 Muslims and Christians came together May 20 to acknowledge their common history and ancient bonds as Toronto’s Pontifical Institute of Mediaeval Studies awarded His Highness the Aga Khan with its highest degree. In his role as chancellor of the prestigious graduate school, Cardinal Thomas Collins bestowed an honourary doctor of letters in Mediaeval Studies on the spiritual leader of the world’s 15 million Ismaili Muslims. Collins praised the Aga Khan as a religious voice of reason, peace and humanity. The honourary doctorate highlights a new program at the 87-year-old pontifical institute attached to St. Michael’s College in the University of Toronto. In the last year the institute has initiated a program that concentrates on the three Abrahamic faiths and their interaction in the mediaeval period. Without the contributions of Muslims scholars, the rediscovery of Plato and Aristotle, which led to the philosophical and theological achievements of Thomas Aquinas, would not have been possible. 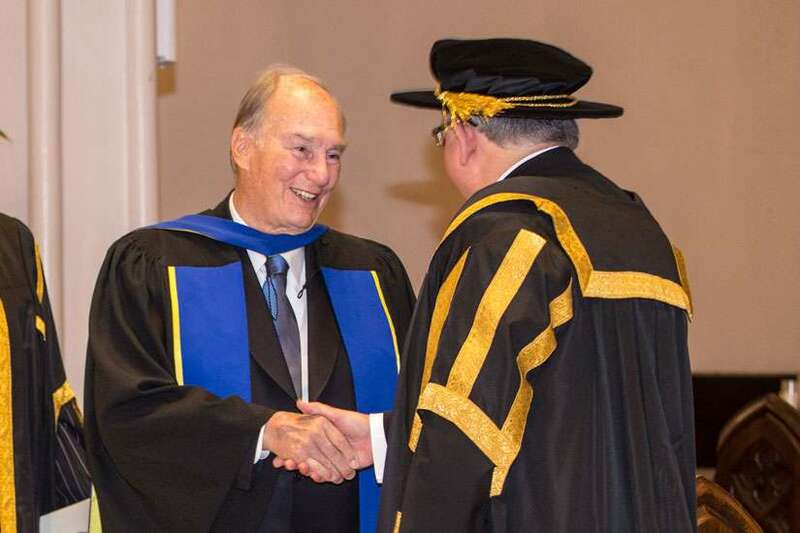 As an honourary Canadian citizen and founder of Toronto’s Aga Khan Museum, the Aga Khan is well known in Canada, but should be celebrated as “a champion of pluralism, a transcender of borders and barriers and a great, wise and benevolent connector,” said University of St. Michael’s College president David Mulroney. In our own time the Aga Khan has been “one of our world’s most effective voices for moderation, mutual understanding and acceptance and human advancement,” said institute president Richard Alway. The audience of about 700 Catholic and Ismaili community members at St. Basil’s Church included former Governor General Adrienne Clarkson and Calgary Mayor Neheed Nenshi. The Pontifical Institute of Mediaeval Studies held a special convocation on 20th May in St Basil’s Collegiate Church to confer an honorary degree on His Highness the Aga Khan. The Aga Khan was honoured for the remarkable range of social, cultural and religious contributions he has made in so many parts of the world both personally and through his Aga Khan Development Network. Tribute was also paid to His Highness for the recent establishment of the Aga Khan Museum and Ismaili Centre in Toronto which have enriched the intellectual and cultural life of our city. The Institute's Praeses Richard Alway pointed out that it was particularly fitting for the Institute to award His Highness an honorary degree in Medieval Studies. From its founding in 1929, the Institute has been an academic pioneer in North America with its multidisciplinary approach to the study of the medieval period including the influence of cultural and intellectual developments in the Muslim world, particularly in philosophy, mathematics and science, from which the Christian West greatly benefited. The Praeses (left) and His Highness the Aga Khan (right). Fr. Allan Smith hooding His Highness the Aga Khan with the help of Fr. Mario D'Souza. His Eminence Thomas Cardinal Collins (right) and Dr. Richard Alway, Praeses (left), look on. The event was reported by The Ismaili, and David Mulroney, President of the University of St Michael’s College, has posted his remarks. Canada’s oldest humanities research, the Pontifical Institute for Mediaeval Studies, awarded Mawlana Hazar Imam an honorary degree for his service to humanity at a ceremony in Toronto on 20 May 2016. Is the second video different from the previous? I do not have a good link so I can't access for the moment during my travel. Does the video contain Hazar Imam's lecture? I think all the versions are more or less the same accept that the latest one is from the 'official' site. MHI did not deliever a lecture on that occasion.